Definition at line 114 of file checker.hpp. Definition at line 92 of file checker.cpp. Definition at line 102 of file checker.cpp. 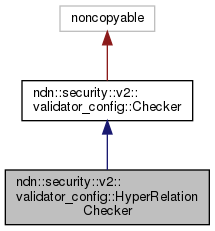 References ndn::security::v2::validator_config::checkNameRelation(), ndn::RegexTopMatcher::expand(), ndn::RegexTopMatcher::match(), and ndn::security::v2::ValidationError::POLICY_ERROR.